When I first began my training to become a biblical counselor, I purchased Jay Adams’ Christian Counselor’s New Testament and Proverbs. It was a helpful tool as I began to familiarize myself with the most-used verses and passages for biblical counseling. I’m glad I have it, but honestly, I don’t use it much anymore. Since it is just the text of the New Testament and Proverbs, once I’d memorized those most-used passages, and honed my own skills at finding applicable Scripture, it mostly sits on the shelf. But now, there is a new Bible available that I believe every counselor or discipler should own. The Beyond Suffering Bible from Joni and Friends is an amazing resource for anyone who wants to come alongside a suffering friend. Joni Eareckson Tada was injured in a diving accident when she was 17 years old. Now 68, she has lived as a quadriplegic her entire life. After 50 years in a wheelchair, during which she’s experienced several bouts of unrelenting pain and a battle with breast cancer, Joni definitely knows about suffering! Yet, through it all, she has continued to pour her heart and life out for the Lord, through Joni and Friends. 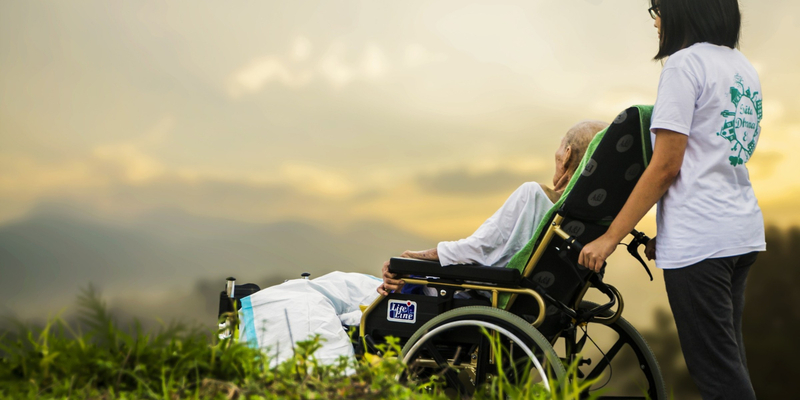 Through this ministry, disabled individuals and their families throughout the world have received wheelchairs and other assistive devices, opportunities to go to family camp, and emotional and spiritual support for the long haul of a life of disability. I have read most of Joni’s writing, and was thrilled to see that she had finally produced an entire Bible full of notes with the same type of encouragement that I’ve found in her books. Presented alongside the New Living Translation, she applies the Word of God to the struggles of disability and other kinds of suffering in a unique and targeted way. Many study and life application bibles do this in a general way, but Joni, so intimately familiar with the sorrow of physical suffering, really goes to the heart. She addresses issues of the isolation, loneliness, and sorrow of limited mobility in ways that only a fellow sufferer could express. I’m glad she chose the NLT, because it is so easy to read. Joni has not left out those with intellectual disabilities from her ministry, and the NLT is probably the best version for those who struggle in this way. But this is not just a regular Bible sprinkled here and there with application about disability. It is thoughtfully laid out, and includes many organizational features along the way. For example, each book begins with an introduction. It includes a general orientation to the book, but it also prepares the reader by pointing out key suffering and disability themes to look for as you read. There are also many biographical profiles throughout the Bible of real people who applied the truths found here and gained victory over self-pity and depression. Some are people whose stories are in the Bible, but many are modern-day sufferers who found comfort and joy in the Scriptures, and then shared that comfort with others through personal ministry. Finally, you’ll find “Connection Points” on just about every page. These are similar to study notes, but focused on helping you make connections specifically with a biblical theology of suffering. I have found these extremely helpful for personal application, but also as I prepare for counseling sessions. Let’s face it, just about everyone who comes for counseling is suffering in some way. Otherwise, they wouldn’t be there! 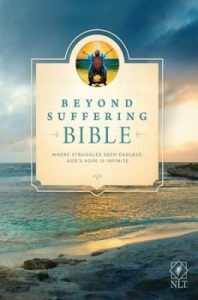 In the Beyond Suffering Bible, while geared toward physical pain and suffering, the connection points are relevant for many kinds of counseling challenge. These notes teach us how to apply the passages to specific troubles, as well as to the Christian walk in general. I’d been looking forward to the publication of the Beyond Suffering Bible since I’d heard it was coming, and I was definitely not disappointed. In fact, I was pleasantly surprised by the relevance of all the notes, features, and devotionals within it. I expected lots of application for physical pain and disability, and that is definitely here; but it is written in a way that makes it easily generalized to any kind of suffering, and that is the most helpful thing about it! If you know someone who is suffering, this would make a great Christmas gift. If you are a counselor or discipler, you need the Beyond Suffering Bible! Very reasonably priced, at just under $16 for the paperback, ($9.99 on Kindle), it is an affordable resource that will spend very little time on your bookshelf.